There has already been two deadly fires in Minneapolis this year, both occurring within a month of each other. One left five children dead on February 14th, and another left two adults dead on March 11th. In both cases, smoke alarms were present. The vast majority of residential smoke alarms are ionization alarms, which take a long time to respond to smoldering fires. In many cases, they respond too late. There is a different type of smoke alarm, available everywhere that smoke alarms are sold, which does not have this problem. It's called a photoelectric smoke alarm. If you don't have photoelectric smoke alarms installed in your home, get them. They're less prone to nuisance alarms and they respond to smoldering fires an average of 30 minutes faster. Photoelectric smoke alarms are also not much more expensive than ionization smoke alarms. 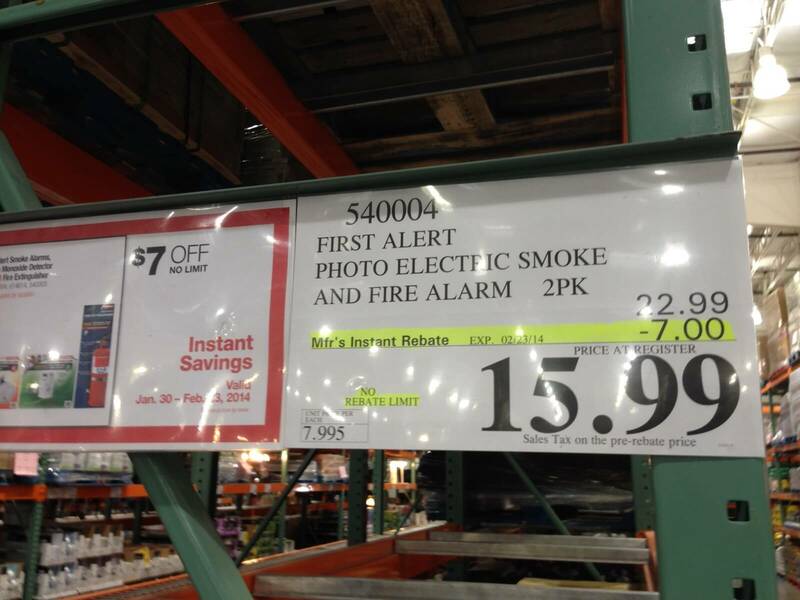 The photo below shows a price tag at Costco, selling a two-pack for $15.99. I blogged about these smoke alarms last year (Photoelectric Smoke Alarms Are All You Need), where I included a couple of compelling news videos that should be enough to convince anyone who watches them to install photoelectric smoke alarms. Photoelectric smoke alarms are currently required in Massachusetts, Maine, and Vermont. All new smoke alarms in Iowa must be dual-sensor smoke alarms, which must have a photoelectric sensor. Boston Deputy Fire Chief Jay Fleming is a huge proponent of photoelectric smoke alarms. When news stories come out about people dying in fires, Jay reaches out to that community urging them to make changes. San Bruno home inspector Skip Walker is leading the charge in the home inspection community. He spends his days inspecting houses and his evenings campaigning for photoelectric smoke alarms. The World Fire Safety Foundation calls ionization smoke alarms "deadly". The International Association of Fire Fighters advocates the use of photoelectric smoke alarms. The American Society of Home Inspectors advocates the use of photoelectric smoke alarms. Again, if you don't have photoelectric smoke alarms in your home, get them. 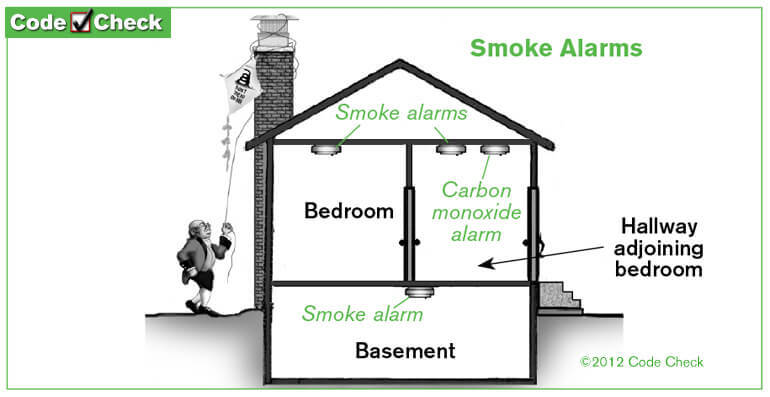 At a minimum, smoke alarms should be installed inside of each bedroom, and in at least one common area on every level. The manufacturers installation instructions should be followed when installing smoke alarms. 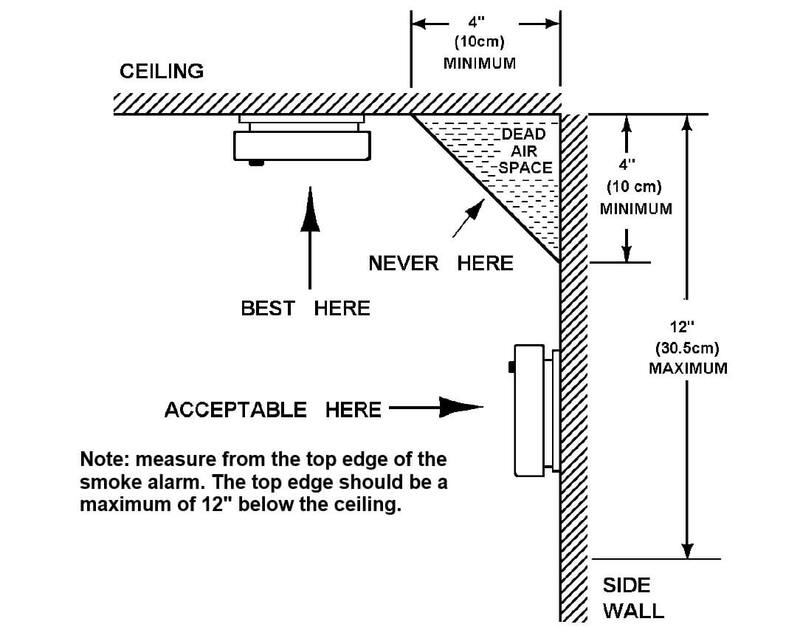 The best place for a smoke alarm is typically on the ceiling, in the middle of the room. 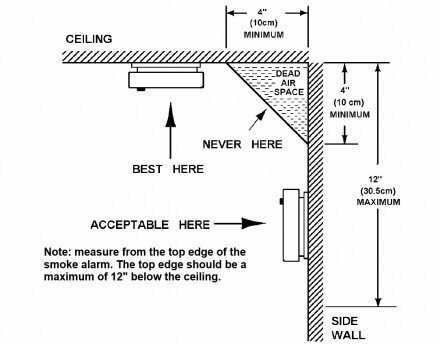 If the smoke alarm is going to be installed on a wall or on the ceiling near a wall, don't place it too close to the corner. 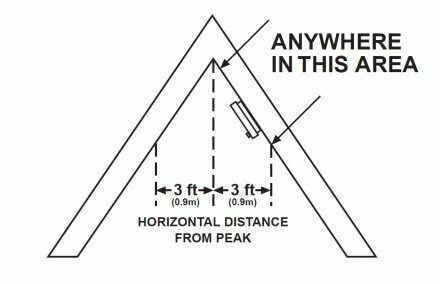 Most manufacturers recommend locating smoke alarms at least 4" away from corners. 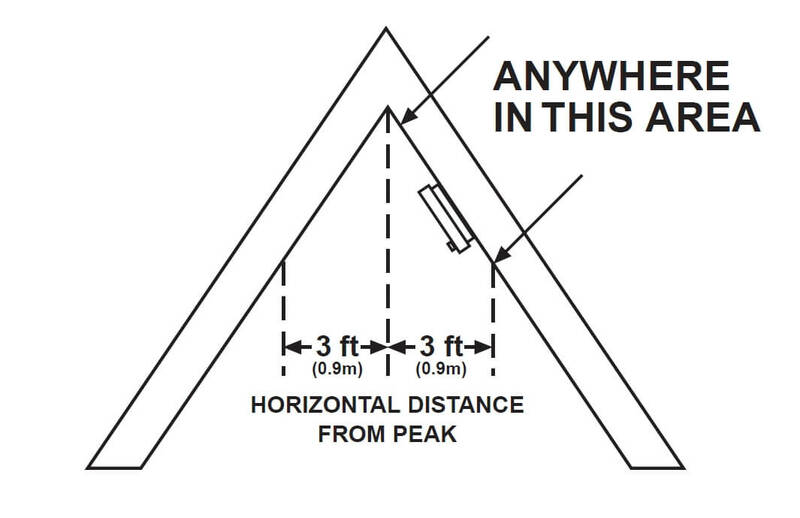 When installing smoke alarms on a sloped or peaked ceiling, use the diagram below for guidance. Smoke alarms should be replaced every ten years. Many smoke alarms have the date on the back of the alarm. 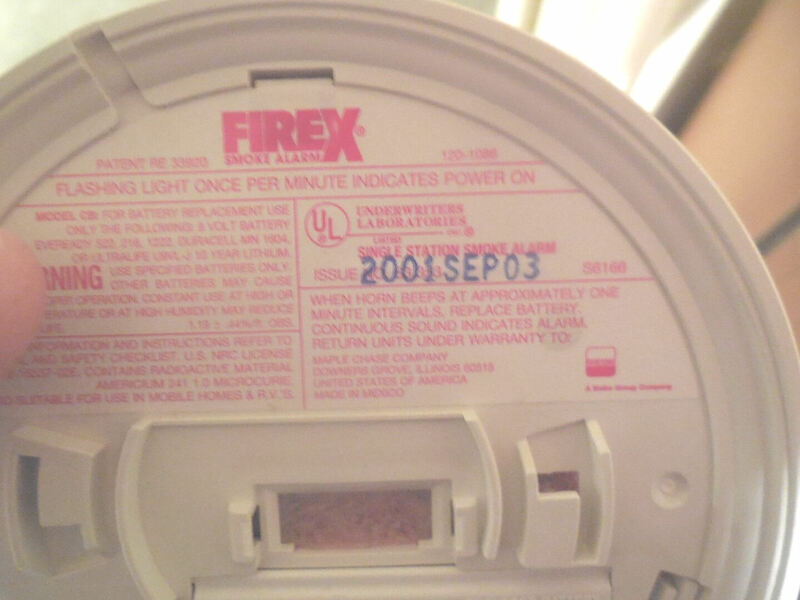 For example, the smoke alarm shown below was manufactured in 2001. If you can't find a date on the back, assume it's over ten years old and replace it. Because CO alarms are only good for five or seven years, I don't recommend buying smoke alarm / CO alarm combo units. Buy individual alarms. While homes built within the last twenty years have interconnected, hardwired smoke alarms with battery backups, older homes typically just have independent battery operated smoke alarms. 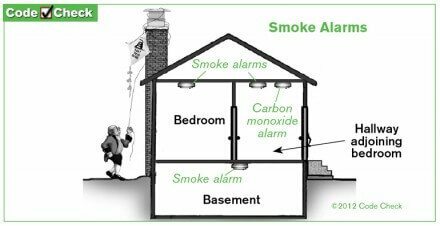 If a smoke alarm sounds in a basement and the occupants are sleeping on the second floor, will it wake them up? That's where wireless smoke alarms come in. 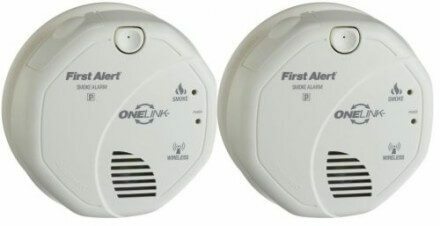 These smoke alarms communicate with each other just like interconnected hardwired smoke alarms; if one goes off, they all go off. Amazon currently sells a two-pack of photoelectric, battery operated, wireless smoke alarms for about $75. Up to eighteen alarms can be interconnected this way. To know if your existing smoke alarms are interconnected, hold down the test button and listen for all of the smoke alarms to sound at the same time. Sometimes there will be a slight delay between when the first alarm sounds and the rest of the alarms sound, other times they all sound at the same time, like they do in the short video clip below. I'm assuming everyone already knows to test their smoke alarms and replace the batteries regularly, so I'm not including those in this list. p.s. - Usually when someone says smoke "detector", they really mean smoke "alarm". They're not the same thing.